Just a quickie update on the Free Farm Stand. Things are going great, recently every Sunday has been gorgeous and the sunny weather has been a treat. It also seems to bring the crowds out. Unfortunately the last two weeks we have had so little produce to share, though the second shift we have been loaded with fruit. I have been able to bring some seedlings, this week cabbage, and they are very popular. I talked to one Latino man who loves taking the seedlings and he said he grows them for his grand daughter so she can have the experience of growing a garden. He doesn’t get a lot of produce to eat from his tiny garden, I think he grows things in containers, but he really enjoys growing the plants we supply. 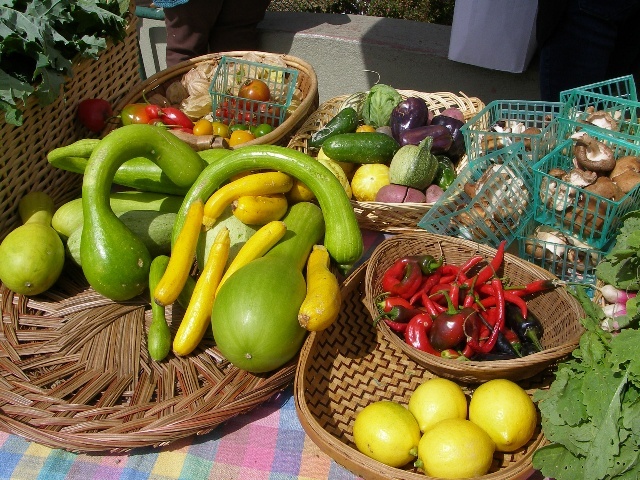 This is the real goal of the Free Farm Stand is getting people to grow some of their own produce. The Free Farm is winding down in terms of what we can bring to the stand right now. 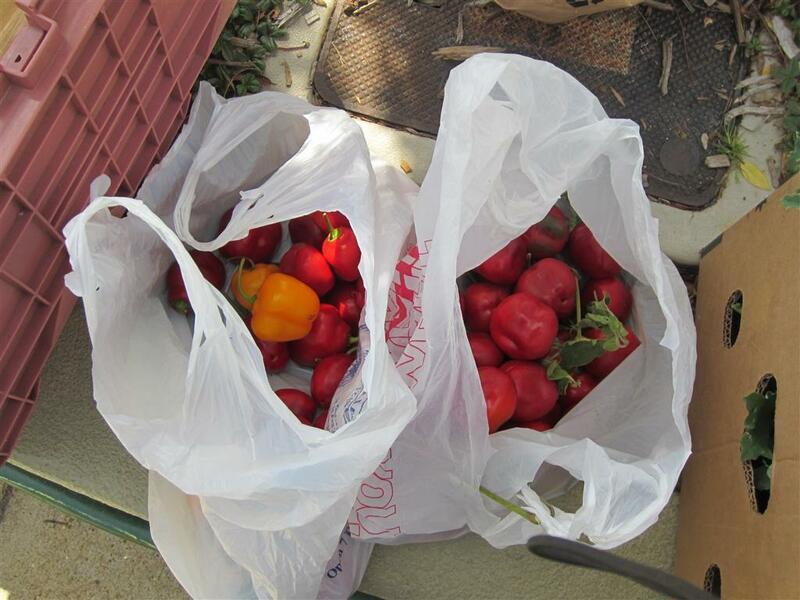 We are bringing the last of the summer crops like tomatoes and peppers and squash. 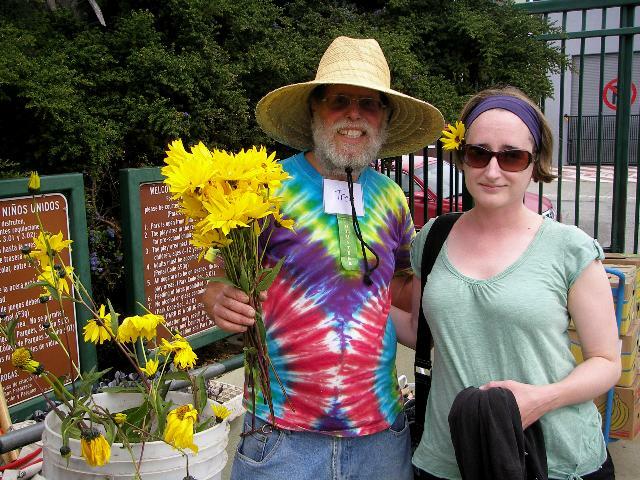 I also brought some of the beautiful perennial sunflowers that I so much enjoy. How local can we get…Ross and I harvested chestnuts I planted in 1982 on 23rd St. a block from the Stand. 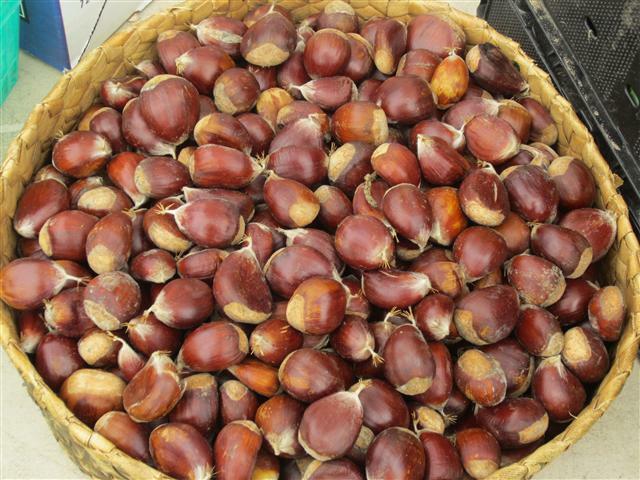 I noticed a friend of mine wrote on her blog about her chestnut harvest in NE Georgia: http://madhupamaypop.com/2012/09/07/chestnuts-winter-is-near-fall-is-here/. Our chestnuts look somewhat the same because hers are Chinese Chestnuts while ours has some Chinese heritage in them. October 1st is World Meatless Lunch Day http://worldmeatlesslunch.org/. “For the first time, there will be a global movement where all people shall join together on one “virtual table” to see whether they can find a better alternative to meat during lunch break on October 1, 2012.” I wonder how many people know that the Free Farm Stand promotes a vegan diet, though some weeks we get bread or pizza from Arizimendi Bakery that is not vegan. Our Sunday I heard from Ryan that Kezar Gardens got another eviction notice. I had been there for the Be-in and it was the first time I had seen the garden. It is really beautiful and I don’t understand why the garden has to move out (or for that matter why does the recycling center have to move out too?). Is San Francisco supposed to be “green” and supports recycling and gardens. Does it matter who uses the garden or recycling center, isn’t it all good? I guess we need to keep an ear open in case they really go ahead with the eviction, I have a feeling there will be non-violent love warriors there try to stop it. 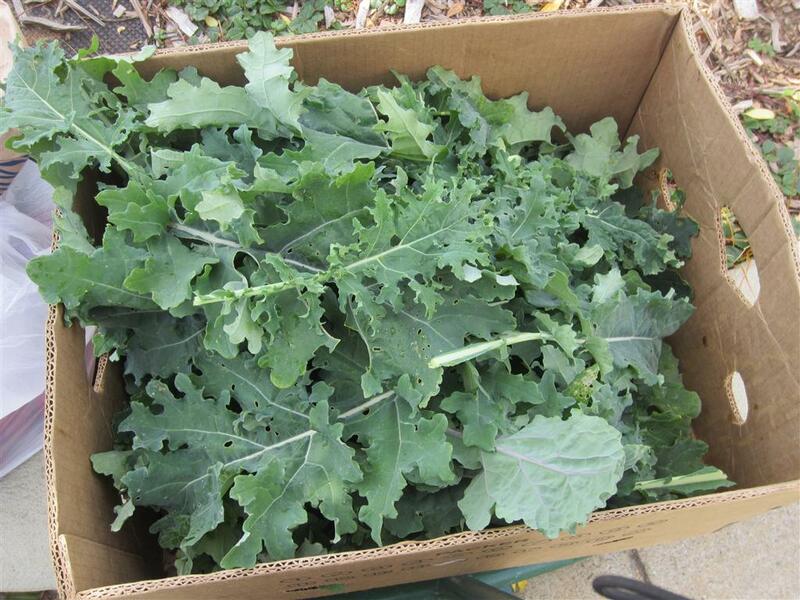 Art grew some extra kale in his garden plot in Potrero del Sol garden and brought it by. I really appreciated the vegetables because we got so little left-overs from the farmer’s markets. It was so fresh and was fresher than the vegetables we got on Saturday. 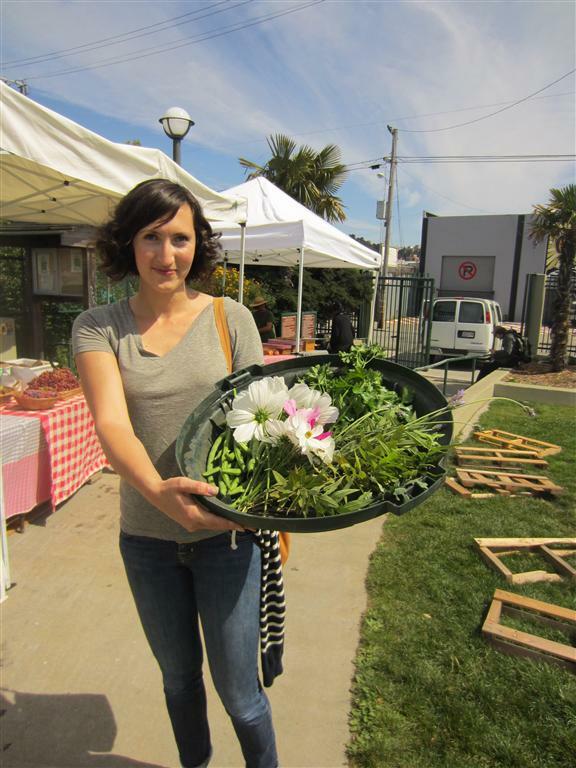 Kimberly brought some produce from the Secret Garden, including cosmos flowers that I didn’t recognize. It was a nice day though we had less produce than usual for the first half. We had so much fruit the second half I wound up taking it home and am now trying to find people to use it. On sunny days like we have been having the larger crowds and though we usually have nothing left, people can on take so much fruit. A week or so ago I got an email from Liz with the folks on the Yes on 37 campaign trying to get GMO food labeled and they wanted to set up a table next to our Free Farm Stand. I told her that our stand avoids endorsing political campaigns though I liked fighting for people having the right to know what is in their food. I suggested they set up on a blanket on the lawn so it wasn’t part of the Free Farm Stand. So they came out this Sunday with literature in both Spanish and English which I appreciated and I got a cute button that says GMO Free Farmer. I have a lot of mixed feelings participating in the voting process because of all the money that goes into the ballot fight. Even with this issue I know it is David and Goliath fighting companies like Monsanto or Dow that are really evil, but one also has to be fair and see that questionable doctors like Joseph Mercola are putting in tons of money also ($1.1 million I read) in the Yes campaign. Trying to getting GMO labeling passed in the legislature apparently hasn’t been successful, so people feel like they have to put this to vote. When it comes down to it, the best thing one can do is grow some of your own food and saving some of your own seed. We can’t change the world with these kind of actions, but we can move in the right direction on a small scale and I think that is the best we can do. Here are some pictures from the Heirloom Expo. It was a fabulous event, though I am not into the what I call hype about heirlooms. Heirlooms are great that you can save the seed because they are not hybrids and they are the precious germplasm that we need to keep alive to preserve genetic diversity. Heirlooms though need to be grown and bred and new varieties need to be developed. That is their beauty , but a lot of companies are selling heirlooms like they should be the same varieties you grow again and again without saving your own seed from them and without tinkering with the variety by breeding it. There was also a lot of commercialism at the event, a lot of folks trying to sell you the best garden amendments like compost or rock dust, etc. When I went around the vendors I had to focus on what I was looking for, like seeds and garlic. There were also a lot of inspiring speakers and I learned much about apples, root crops, “the father of perennial agriculture in the West”, Felix Gillet (check out this article http://www.bioneers.org/programs/food-farming-1/articles-interviews/treasure-of-the-sierra-foothills-a-cornucopia-of-heritage-fruit-and-nut-trees-discovered-and-preserved), about a better approach to living with bees, and I learned from Gary Nabhan the “Terroir-ist Manifesto” which I will reprint some of it at the end.